An English Homestead: Oh The Shame! 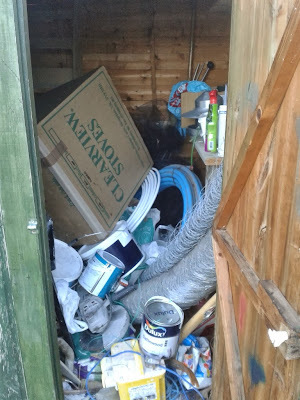 I am a man of many sheds, but there has been one that lately I just open the door and chuck things into. 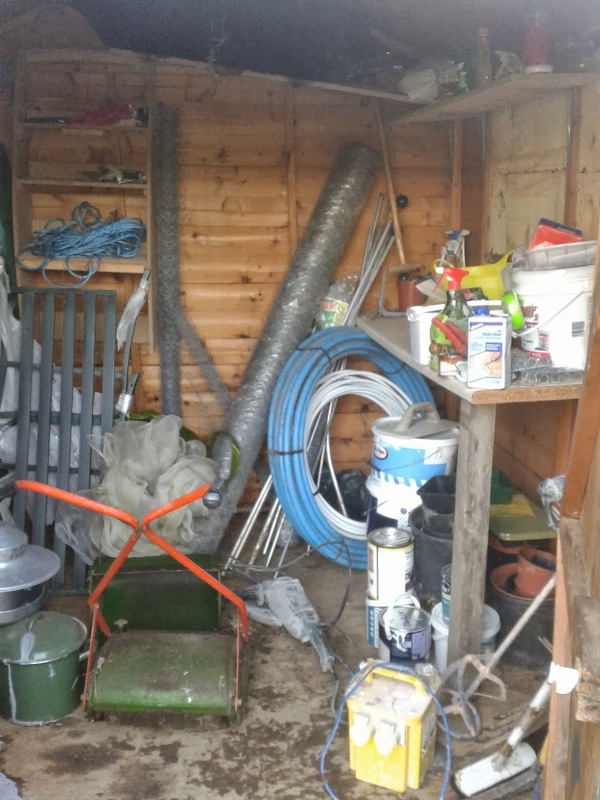 This is my old allotment shed and I feel it has been neglected somewhat! Open door - chuck thing in - quickly close door before it all falls out! My mother came up to visit last week and ﻿she wanted me to put some of Ev's toys away in the shed. I had to say there was no room. I got talked into opening the shed. I was a little ashamed. I decided to clean it out there and then. She was guilted into helping me. Not much better but I can now see the floor and get into the shed! 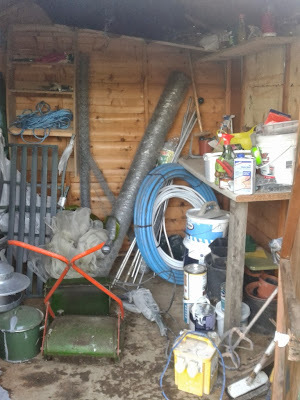 To be fair it didn't take long and it feels so much better knowing I can get back into what used to be a really useful garden shed! Also this has given me an area to sort out and store my paints until things turn a little colder. I think everyone has a little area of shame! I do keep my other sheds quite tidy so I'm not all bad, although this one was getting dangerous! Ha! You'll have to show your shed of shame now! We all need a place where we can dump stuff without thinking about it.... Once or twice a year it will need some sorting out. Chuck out the dried up paint cans and broken flower pots. Your right, This was handy while I was doing the livingroom, I was finishing so late I didn't want to think, just chuck and shut the door! You should see the inside of my wife's wardrobe. Could you send your mum over to shame Him Outside into tidying up his workshop!